For the story by Larry Niven, see Neutron Star (short story). A neutron star is the collapsed core of a large (10–29 solar masses) star. Neutron stars are the smallest and densest stars known to exist. With a radius on the order of 10 km, they can, however, have a mass of about twice that of the Sun. They result from the supernova explosion of a massive star, combined with gravitational collapse, that compresses the core past the white dwarf star density to that of atomic nuclei. Most of the basic models for these objects imply that neutron stars are composed almost entirely of neutrons, which are subatomic particles with no net electrical charge and with slightly larger mass than protons. They are supported against further collapse by neutron degeneracy pressure, a phenomenon described by the Pauli exclusion principle. If the remnant has too great a density, something which occurs in excess of an upper limit of the size of neutron stars at 2-3 solar masses, it will continue collapsing to form a black hole. Neutron stars that can be observed are very hot and typically have a surface temperature around 7005600000000000000♠6×105 K.[lower-alpha 1] They are so dense that a normal-sized matchbox containing neutron-star material would have a mass of approximately 13 million tonnes, or a 2.5 million m3 chunk of the Earth (a cube with edges of about 135 metres). They have strong magnetic fields, between 108 and 1015 times that of Earth's. The gravitational field at the neutron star's surface is about 2×1011 times that of the Earth's. As the star's core collapses, its rotation rate increases as a result of conservation of angular momentum, hence newly formed neutron stars rotate at up to several hundred times per second. Some neutron stars emit beams of electromagnetic radiation that make them detectable as pulsars. Indeed, the discovery of pulsars in 1967 was the first observational suggestion that neutron stars exist. The radiation from pulsars is thought to be primarily emitted from regions near their magnetic poles. If the magnetic poles do not coincide with the rotational axis of the neutron star, the emission beam will sweep the sky, and when seen from a distance, if the observer is somewhere in the path of the beam, it will appear as pulses of radiation coming from a fixed point in space (the so-called "lighthouse effect"). The fastest rotation rate for a neutron star was a rate of 716 times a second or 43,000 revolutions per minute, giving a linear speed at the surface on the order of 6999165000000000000♠0.165 c.
There are thought to be around 100 million neutron stars in the Milky Way, a figure obtained by estimating the number of stars that have undergone supernova explosions. However, most are old and cold, and neutron stars can only be easily detected in certain instances, such as if they are a pulsar or part of a binary system. Slow-rotating and non-accreting neutron stars are virtually undetectable; however, since the Hubble Space Telescope detection of RX J185635-3754, a few nearby neutron stars that appear only to emit thermal radiation have been detected. Soft gamma repeaters are conjectured to be a type of neutron star with very strong magnetic fields, known as magnetars, or alternatively, neutron stars with fossil disks around them. Neutron stars in binary systems can undergo accretion which typically makes the system bright in x-rays while the material falling onto the neutron star can form hotspots that rotate in and out of view in identified X-ray pulsar systems. Additionally, such accretion can "recycle" old pulsars and potentially cause them to gain mass and spin-up to very fast rotation rates, forming the so-called millisecond pulsars. These binary systems will continue to evolve, and eventually the companions can become compact objects such as white dwarfs or neutron stars themselves, though other possibilities include a complete destruction of the companion through ablation or merger. The merger of binary neutron stars may be the source of short-duration gamma-ray bursts and are likely strong sources of gravitational waves. Though as of 2016 no direct detection of the gravitational waves from such an event has been made, gravitational waves have been indirectly detected in a system where two neutron stars orbit each other. Any main-sequence star with an initial mass of above 8 M☉ has the potential to produce a neutron star. As the star evolves away from the main sequence, subsequent nuclear burning produces an iron-rich core. When all nuclear fuel in the core has been exhausted, the core must be supported by degeneracy pressure alone. Further deposits of mass from shell burning cause the core to exceed the Chandrasekhar limit. Electron-degeneracy pressure is overcome and the core collapses further, sending temperatures soaring to over 7009500000000000000♠5×109 K. At these temperatures, photodisintegration (the breaking up of iron nuclei into alpha particles by high-energy gamma rays) occurs. As the temperature climbs even higher, electrons and protons combine to form neutrons via electron capture, releasing a flood of neutrinos. When densities reach nuclear density of 7017400000000000000♠4×1017 kg/m3, neutron degeneracy pressure halts the contraction. The infalling outer envelope of the star is halted and flung outwards by a flux of neutrinos produced in the creation of the neutrons, becoming a supernova. The remnant left is a neutron star. If the remnant has a mass greater than about 3 M☉, it collapses further to become a black hole. As the core of a massive star is compressed during a Type II supernova, Type Ib or Type Ic supernova, and collapses into a neutron star, it retains most of its angular momentum. But, because it has only a tiny fraction of its parent's radius (and therefore its moment of inertia is sharply reduced), a neutron star is formed with very high rotation speed, and then over a very long period it slows. Neutron stars are known that have rotation periods from about 1.4 ms to 30 s. The neutron star's density also gives it very high surface gravity, with typical values ranging from 1012 to 1013 m/s2 (more than 1011 times that of Earth). One measure of such immense gravity is the fact that neutron stars have an escape velocity ranging from 100,000 km/s to 150,000 km/s, that is, from a third to half the speed of light. The neutron star's gravity accelerates infalling matter to tremendous speed. The force of its impact would likely destroy the object's component atoms, rendering all the matter identical, in most respects, to the rest of the neutron star. A neutron star has a mass of at least 1.1 and perhaps up to 3 solar masses (M☉). The maximum observed mass of neutron stars is about 2.01 M☉. But in general, compact stars of less than 1.39 M☉ (the Chandrasekhar limit) are white dwarfs, whereas compact stars with a mass between 1.4 M☉ and 3 M☉ (the Tolman–Oppenheimer–Volkoff limit) should be neutron stars (though there is a regime of a few tenths of a solar mass where the masses of low-mass neutron stars and high-mass white dwarfs can overlap). Between 3 M☉ and 5 M☉, hypothetical intermediate-mass stars such as quark stars and electroweak stars have been proposed, but none have been shown to exist. Beyond 10 M☉ the stellar remnant will overcome the neutron degeneracy pressure and gravitational collapse will usually occur to produce a black hole, though the smallest observed mass of a stellar black hole is about 5 M☉. The temperature inside a newly formed neutron star is from around 1011 to 1012 Kelvin. However, the huge number of neutrinos it emits carry away so much energy that the temperature of an isolated neutron star falls within a few years to around 106 kelvin. Even at this lower temperature, most of the light generated by a neutron star is in X-rays. Neutron stars have overall densities of 7017370000000000000♠3.7×1017 to 7017590000000000000♠5.9×1017 kg/m3 (7014260000000000000♠2.6×1014 to 7014409999999999999♠4.1×1014 times the density of the Sun),[lower-alpha 2] which is comparable to the approximate density of an atomic nucleus of 7017300000000000000♠3×1017 kg/m3. The neutron star's density varies from about 7009100000000000000♠1×109 kg/m3 in the crust—increasing with depth—to about 7017600000000000000♠6×1017 or 7017800000000000000♠8×1017 kg/m3 (denser than an atomic nucleus) deeper inside. A neutron star is so dense that one teaspoon (5 milliliters) of its material would have a mass over 7012550000000000000♠5.5×1012 kg (that is 1100 tonnes per 1 nanolitre), about 900 times the mass of the Great Pyramid of Giza. [lower-alpha 3] The pressure increases from 3×1033 to 1.6×1035 Pa from the inner crust to the center. The equation of state of matter at such high densities is not precisely known because of the theoretical difficulties associated with extrapolating the likely behavior of quantum chromodynamics, superconductivity, and superfluidity of matter in such states along with the empirical difficulties of observing the characteristics of neutron stars that are at least hundreds of parsecs away. A neutron star has some of the properties of an atomic nucleus, including density (within an order of magnitude) and being composed of nucleons. In popular scientific writing, neutron stars are therefore sometimes described as giant nuclei. However, in other respects, neutron stars and atomic nuclei are quite different. In particular, a nucleus is held together by the strong interaction, whereas a neutron star is held together by gravity, and thus the density and structure of neutron stars can be more variable. Neutron stars have strong magnetic fields. The magnetic field strength on the surface of neutron stars have been estimated at least to have the range of 108 to 1015 gauss (104 to 1011 tesla). In comparison, the magnitude at Earth's surface ranges from 25 to 65 microteslas (0.25 to 0.65 gauss), making the field at least 108 times as strong as that of Earth. Variations in magnetic field strengths are most likely the main factor that allows different types of neutron stars to be distinguished by their spectra, and explains the periodicity of pulsars. The neutron stars known as magnetars have the strongest magnetic fields, in the range of 108 to 1011 tesla, and have become the widely accepted hypothesis for neutron star types soft gamma repeaters (SGRs) and anomalous X-ray pulsars (AXPs). The origins of the strong magnetic field are as yet unclear. One hypothesis is that of "flux freezing", or conservation of the original magnetic flux takes place during the formation of the neutron star. If an object has a certain magnetic flux over its surface area, and that area shrinks to a smaller area, but the magnetic flux is conserved, then the magnetic field would correspondingly increase. Likewise, a collapsing star begins with a much larger surface area than the resulting neutron star, and conservation of magnetic flux would result in a far stronger magnetic field. However, this simple explanation does not fully explain magnetic field strengths of neutron stars. Gravitational light deflection at a neutron star. Due to relativistic light deflection more than half of the surface is visible (each chequered patch here represents 30 degrees by 30 degrees). In natural units, the mass of the depicted star is 1 and its radius 4, or twice its Schwarzschild radius. The gravitational field at a neutron star's surface is about 2×1011 times stronger than on Earth, at around 1.86×108 m/s2. Such a strong gravitational field acts as a gravitational lens and bends the radiation emitted by the neutron star such that parts of the normally invisible rear surface become visible. If the radius of the neutron star is or less, then the photons may be trapped in an orbit, thus making the whole surface of that neutron star visible, along with destabilizing orbits at that and less than that of the radius. A fraction of the mass of a star that collapses to form a neutron star is released in the supernova explosion from which it forms (from the law of mass-energy equivalence, E = mc2). The energy comes from the gravitational binding energy of a neutron star. Hence, the gravitational force of a typical neutron star is huge. If an object were to fall from a height of one meter in a neutron star 12 kilometers in radius, it would reach the ground at around 1.4 million meters per second, or 5 million kilometers per hour. Because of the enormous gravity, time dilation between a neutron star and Earth is significant. For example, eight years could pass on the surface of a neutron star, yet ten years would have passed on Earth, not including the time-dilation effect of their very rapid rotation. A 2 M☉ neutron star would not be more compact than 10,970 meters radius (AP4 model). Its mass fraction gravitational binding energy would then be 0.187, −18.7% (exothermic). This is not near 0.6/2 = 0.3, −30%. The equation of state for a neutron star is still not known. It is assumed that it differs significantly from that of a white dwarf, whose equation of state is that of a degenerate gas that can be described in close agreement with special relativity. However, with a neutron star the increased effects of general relativity can no longer be ignored. Several equations of state have been proposed (FPS, UU, APR, L, SLy, and others) and current research is still attempting to constrain the theories to make predictions of neutron star matter. This means that the relation between density and mass is not fully known, and this causes uncertainties in radius estimates. For example, a 1.5 M☉ neutron star could have a radius of 10.7, 11.1, 12.1 or 15.1 kilometers (for EOS FPS, UU, APR or L respectively). Cross-section of neutron star. Densities are in terms of ρ0 the saturation nuclear matter density, where nucleons begin to touch. Current understanding of the structure of neutron stars is defined by existing mathematical models, but it might be possible to infer some details through studies of neutron-star oscillations. Asteroseismology, a study applied to ordinary stars, can reveal the inner structure of neutron stars by analyzing observed spectra of stellar oscillations. Current models indicate that matter at the surface of a neutron star is composed of ordinary atomic nuclei crushed into a solid lattice with a sea of electrons flowing through the gaps between them. It is possible that the nuclei at the surface are iron, due to iron's high binding energy per nucleon. It is also possible that heavy elements, such as iron, simply sink beneath the surface, leaving only light nuclei like helium and hydrogen. If the surface temperature exceeds 106 kelvin (as in the case of a young pulsar), the surface should be fluid instead of the solid phase that might exist in cooler neutron stars (temperature <106 kelvin). The "atmosphere" of a neutron star is hypothesized to be at most several micrometers thick, and its dynamics are fully controlled by the neutron star's magnetic field. Below the atmosphere one encounters a solid "crust". This crust is extremely hard and very smooth (with maximum surface irregularities of ~5 mm), due to the extreme gravitational field. The expected hierarchy of phases of nuclear matter in the inner crust has been characterized as nuclear pasta. Proceeding inward, one encounters nuclei with ever-increasing numbers of neutrons; such nuclei would decay quickly on Earth, but are kept stable by tremendous pressures. As this process continues at increasing depths, the neutron drip becomes overwhelming, and the concentration of free neutrons increases rapidly. In that region, there are nuclei, free electrons, and free neutrons. The nuclei become increasingly small (gravity and pressure overwhelming the strong force) until the core is reached, by definition the point where mostly neutrons exist. The composition of the superdense matter in the core remains uncertain. One model describes the core as superfluid neutron-degenerate matter (mostly neutrons, with some protons and electrons). More exotic forms of matter are possible, including degenerate strange matter (containing strange quarks in addition to up and down quarks), matter containing high-energy pions and kaons in addition to neutrons, or ultra-dense quark-degenerate matter. Animation of a rotating pulsar. The sphere in the middle represents the neutron star, the curves indicate the magnetic field lines and the protruding cones represent the emission zones. Neutron stars are detected from their electromagnetic radiation. Neutron stars are usually observed to pulse radio waves and other electromagnetic radiation, and neutron stars observed with pulses are called pulsars. Pulsars' radiation is thought to be caused by particle acceleration near their magnetic poles, which need not be aligned with the rotational axis of the neutron star. It is thought that a large electrostatic field builds up near the magnetic poles, leading to electron emission. These electrons are magnetically accelerated along the field lines, leading to curvature radiation, with the radiation being strongly polarized towards the plane of curvature. In addition, high energy photons can interact with lower energy photons and the magnetic field for electron-positron pair production, which through electron–positron annihilation leads to further high energy photons. The radiation emanating from the magnetic poles of neutron stars can be described as magnetospheric radiation, in reference to the magnetosphere of the neutron star. 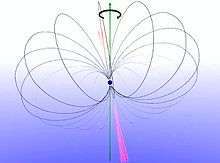 It is not to be confused with magnetic dipole radiation, which is emitted because the magnetic axis is not aligned with the rotational axis, with a radiation frequency the same as the neutron star's rotational frequency. If the axis of rotation of the neutron star is different to the magnetic axis, external viewers will only see these beams of radiation whenever the magnetic axis point towards them during the neutron star rotation. Therefore, periodic pulses are observed, at the same rate as the rotation of the neutron star. In addition to pulsars, neutron stars have also been identified with no apparent periodicity of their radiation. This seems to be a characteristic of the X-ray sources known as Central Compact Objects in Supernova remnants (CCOs in SNRs), which are thought to be young, radio-quiet isolated neutron stars. In addition to radio emissions, neutron stars have also been identified in other parts of the electromagnetic spectrum. This includes visible light, near infrared, ultraviolet, X-rays and gamma rays. Pulsars observed in X-rays are known as X-ray pulsars if accretion-powered; while those identified in visible light as optical pulsars. The majority of neutron stars detected, including those identified in optical, X-ray and gamma rays, also emit radio waves; the Crab Pulsar produces electromagnetic emissions across the spectrum. However, there exist neutron stars called radio-quiet neutron stars, with no radio emissions detected. Neutron stars rotate extremely rapidly after their formation due to the conservation of angular momentum; like spinning ice skaters pulling in their arms, the slow rotation of the original star's core speeds up as it shrinks. A newborn neutron star can rotate many times a second. Over time, neutron stars slow, as their rotating magnetic fields in effect radiate energy associated with the rotation; older neutron stars may take several seconds for each revolution. This is called spin down. The rate at which a neutron star slows its rotation is usually constant and very small. The periodic time (P) is the rotational period, the time for one rotation of a neutron star. The spin-down rate, the rate of slowing of rotation, is then given the symbol (or Pdot), the negative derivative of P with respect to time. It is defined as periodic time decrease per unit time; it is a dimensionless quantity, but can be given the units of s·s−1 (seconds per second). The spin-down rate (Pdot) of neutron stars usually falls within the range of 10−22 to 10−9 s·s−1, with the shorter period (or faster rotating) observable neutron stars usually having smaller Pdot. However, as a neutron star ages, the neutron star slows (P increases) and the rate of slowing decreases (Pdot decreases), until the rate of rotation becomes too slow to power the radio-emission mechanism, and the neutron star can no longer be detected. P and Pdot allow minimum magnetic fields of neutron stars to be estimated. P and Pdot can be also used to calculate the characteristic age of a pulsar, but gives an estimate which is somewhat larger than the true age when it is applied to young pulsars. P and Pdot can also be combined with neutron star's moment of inertia to estimate a quantity called spin-down luminosity, which is given the symbol (or Edot). It is not the measured luminosity, but rather the calculated loss rate of rotational energy that would manifest itself as radiation. For neutron stars where the spin-down luminosity is comparable to the actual luminosity, the neutron stars are said to be "rotation powered". The observed luminosity of the Crab Pulsar is comparable to the spin-down luminosity, supporting the model that rotational kinetic energy powers the radiation from it. With neutron stars such as magnetars, where the actual luminosity exceeds the spin-down luminosity by about a factor of one hundred, it is assumed that the luminosity is powered by magnetic dissipation, rather than being rotation powered. P and Pdot can also be plotted for neutron stars to create a P-Pdot diagram. It encodes a tremendous amount of information about the pulsar population and its properties, and has been likened to the Hertzsprung–Russell diagram in its importance for neutron stars. Neutron star rotational speeds can increase, a process known as spin up. Sometimes neutron stars absorbs orbiting matter from companion stars, increasing the rotation rate and reshaping the neutron star into an oblate spheroid. This causes an increase in the rate of rotation of the neutron star of over a hundred times per second in the case of millisecond pulsars. The most rapidly rotating neutron star currently known, PSR J1748-2446ad, rotates at 716 rotations per second. However, a recent paper reported the detection of an X-ray burst oscillation, which provides an indirect measure of spin, of 1122 Hz from the neutron star XTE J1739-285, suggesting 1122 rotations a second. However, at present, this signal has only been seen once, and should be regarded as tentative until confirmed in another burst from that star. Sometimes a neutron star will undergo a glitch, a sudden small increase of its rotational speed or spin up. Glitches are thought to be the effect of a starquake—as the rotation of the neutron star slows, its shape becomes more spherical. Due to the stiffness of the "neutron" crust, this happens as discrete events when the crust ruptures, creating a starquake similar to earthquakes. After the starquake, the star will have a smaller equatorial radius, and because angular momentum is conserved, its rotational speed has increased. Starquakes occurring in magnetars, with a resulting glitch, is the leading hypothesis for the gamma-ray sources known as soft gamma repeaters. Recent work, however, suggests that a starquake would not release sufficient energy for a neutron star glitch; it has been suggested that glitches may instead be caused by transitions of vortices in the theoretical superfluid core of the neutron star from one metastable energy state to a lower one, thereby releasing energy that appears as an increase in the rotation rate. An "anti-glitch", a sudden small decrease in rotational speed, or spin down, of a neutron star has also been reported. It occurred in a magnetar, that in one case produced an X-ray luminosity increase of a factor of 20, and a significant spin-down rate change. Current neutron star models do not predict this behavior. If the cause was internal, it suggests differential rotation of solid outer crust and the superfluid component of the inner of the magnetar's structure. Central neutron star at the heart of the Crab Nebula. At present, there are about 2000 known neutron stars in the Milky Way and the Magellanic Clouds, the majority of which have been detected as radio pulsars. Neutron stars are mostly concentrated along the disk of the Milky Way although the spread perpendicular to the disk is large because the supernova explosion process can impart high translational speeds (400 km/s) to the newly formed neutron star. 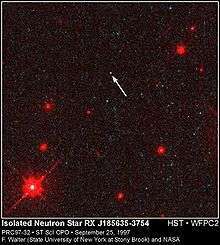 Some of the closest known neutron stars are RX J1856.5-3754, which is about 400 light years away, and PSR J0108-1431 at about 424 light years. RX J1856.5-3754 is a member of a close group of neutron stars called The Magnificent Seven. Another nearby neutron star that was detected transiting the backdrop of the constellation Ursa Minor has been nicknamed Calvera by its Canadian and American discoverers, after the villain in the 1960 film The Magnificent Seven. This rapidly moving object was discovered using the ROSAT/Bright Source Catalog. About 5% of all known neutron stars are members of a binary system. The formation and evolution of binary neutron stars can be a complex process. Neutron stars have been observed in binaries with ordinary main-sequence stars, red giants, white dwarfs or other neutron stars. According to modern theories of binary evolution it is expected that neutron stars also exist in binary systems with black hole companions. The merger of binaries containing two neutron stars, or a neutron star and a black hole, are expected to be prime sources for the emission of detectable gravitational waves. Binary systems containing neutron stars often emit X-rays, which are emitted by hot gas as it falls towards the surface of the neutron star. The source of the gas is the companion star, the outer layers of which can be stripped off by the gravitational force of the neutron star if the two stars are sufficiently close. As the neutron star accretes this gas its mass can increase; if enough mass is accreted the neutron star may collapse into a black hole. Binaries containing two neutron stars are observed to shrink as gravitational waves are emitted. Ultimately the neutron stars will come into contact and coelesce. The coalescence of binary neutron stars is one of the leading models for the origin of short gamma-ray bursts. Strong evidence for this model came from the observation of a kilonova associated with the short-duration gamma-ray burst GRB 130603B. The light emitted in the kilonova is believed to come from the radioactive decay of material ejected in the merger of the two neutron stars. This material may be responsible for the production of many of the chemical elements beyond iron, as opposed to the supernova nucleosynthesis theory. The first direct observation of a neutron star in visible light. The neutron star is RX J1856.5-3754. In 1934, Walter Baade and Fritz Zwicky proposed the existence of neutron stars,[lower-alpha 4] only a year after the discovery of the neutron by Sir James Chadwick. In seeking an explanation for the origin of a supernova, they tentatively proposed that in supernova explosions ordinary stars are turned into stars that consist of extremely closely packed neutrons that they called neutron stars. Baade and Zwicky correctly proposed at that time that the release of the gravitational binding energy of the neutron stars powers the supernova: "In the supernova process, mass in bulk is annihilated". Neutron stars were thought to be too faint to be detectable and little work was done on them until November 1967, when Franco Pacini (1939–2012) pointed out that if the neutron stars were spinning and had large magnetic fields, then electromagnetic waves would be emitted. Unbeknown to him, radio astronomer Antony Hewish and his research assistant Jocelyn Bell at Cambridge were shortly to detect radio pulses from stars that are now believed to be highly magnetized, rapidly spinning neutron stars, known as pulsars. 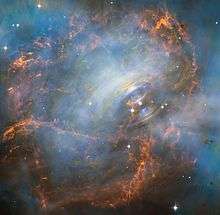 In 1965, Antony Hewish and Samuel Okoye discovered "an unusual source of high radio brightness temperature in the Crab Nebula". This source turned out to be the Crab Pulsar that resulted from the great supernova of 1054. In 1967, Iosif Shklovsky examined the X-ray and optical observations of Scorpius X-1 and correctly concluded that the radiation comes from a neutron star at the stage of accretion. In 1967, Jocelyn Bell Burnell and Antony Hewish discovered regular radio pulses from PSR B1919+21. This pulsar was later interpreted as an isolated, rotating neutron star. The energy source of the pulsar is the rotational energy of the neutron star. The majority of known neutron stars (about 2000, as of 2010) have been discovered as pulsars, emitting regular radio pulses. In 1971, Riccardo Giacconi, Herbert Gursky, Ed Kellogg, R. Levinson, E. Schreier, and H. Tananbaum discovered 4.8 second pulsations in an X-ray source in the constellation Centaurus, Cen X-3. They interpreted this as resulting from a rotating hot neutron star. The energy source is gravitational and results from a rain of gas falling onto the surface of the neutron star from a companion star or the interstellar medium. In 1974, Antony Hewish was awarded the Nobel Prize in Physics "for his decisive role in the discovery of pulsars" without Jocelyn Bell who shared in the discovery. In 1974, Joseph Taylor and Russell Hulse discovered the first binary pulsar, PSR B1913+16, which consists of two neutron stars (one seen as a pulsar) orbiting around their center of mass. Einstein's general theory of relativity predicts that massive objects in short binary orbits should emit gravitational waves, and thus that their orbit should decay with time. This was indeed observed, precisely as general relativity predicts, and in 1993, Taylor and Hulse were awarded the Nobel Prize in Physics for this discovery. In 1982, Don Backer and colleagues discovered the first millisecond pulsar, PSR B1937+21. This object spins 642 times per second, a value that placed fundamental constraints on the mass and radius of neutron stars. Many millisecond pulsars were later discovered, but PSR B1937+21 remained the fastest-spinning known pulsar for 24 years, until PSR J1748-2446ad (which spins more than 700 times a second) was discovered. In 2003, Marta Burgay and colleagues discovered the first double neutron star system where both components are detectable as pulsars, PSR J0737-3039. The discovery of this system allows a total of 5 different tests of general relativity, some of these with unprecedented precision. In 2010, Paul Demorest and colleagues measured the mass of the millisecond pulsar PSR J1614–2230 to be 1.97±0.04 M☉, using Shapiro delay. This was substantially higher than any previously measured neutron star mass (1.67 M☉, see PSR J1903+0327), and places strong constraints on the interior composition of neutron stars. In 2013, John Antoniadis and colleagues measured the mass of PSR J0348+0432 to be 2.01±0.04 M☉, using white dwarf spectroscopy. This confirmed the existence of such massive stars using a different method. Furthermore, this allowed, for the first time, a test of general relativity using such a massive neutron star. 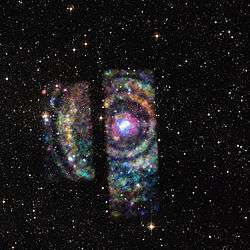 Isolated Neutron Star (INS): not in a binary system. Rotation-powered pulsar (RPP or "radio pulsar"): neutron stars that emit directed pulses of radiation towards us at regular intervals (due to their strong magnetic fields). Rotating radio transient (RRATs): are thought to be pulsars which emit more sporadically and/or with higher pulse-to-pulse variability than the bulk of the known pulsars. Magnetar: a neutron star with an extremely strong magnetic field (1000 times more than a regular neutron star), and long rotation periods (5 to 12 seconds). X-ray Dim Isolated Neutron Stars. Central Compact Objects in Supernova remnants (CCOs in SNRs): young, radio-quiet non-pulsating X-ray sources, thought to be Isolated Neutron Stars surrounded by supernova remnants. X-ray pulsars or "accretion-powered pulsars": a class of X-ray binaries. Low-mass X-ray binary pulsars: a class of low-mass X-ray binaries (LMXB), a pulsar with a main sequence star, white dwarf or red giant. Millisecond pulsar (MSP) ("recycled pulsar"). X-ray burster: a neutron star with a low mass binary companion from which matter is accreted resulting in irregular bursts of energy from the surface of the neutron star. Intermediate-mass X-ray binary pulsars: a class of intermediate-mass X-ray binaries (IMXB), a pulsar with an intermediate mass star. High-mass X-ray binary pulsars: a class of high-mass X-ray binaries (HMXB), a pulsar with a massive star. Binary pulsars: a pulsar with a binary companion, often a white dwarf or neutron star. Theorized compact stars with similar properties. Quark star: currently a hypothetical type of neutron star composed of quark matter, or strange matter. As of 2008, there are three candidates. Electroweak star: currently a hypothetical type of extremely heavy neutron star, in which the quarks are converted to leptons through the electroweak force, but the gravitational collapse of the neutron star is prevented by radiation pressure. As of 2010, there is no evidence for their existence. 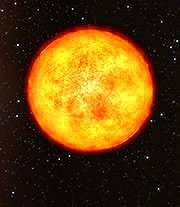 Preon star: currently a hypothetical type of neutron star composed of preon matter. As of 2008, there is no evidence for the existence of preons. PSR B1509-58 source of the "Hand of God" photo shot by the Chandra X-ray Observatory. PSR J0348+0432 – the most massive neutron star with a well-constrained mass, 2.01 ± 0.04 M☉. Video - Neutron stars contain 500,000 Earth-masses in 25 km (16 mi) dia. sphere. 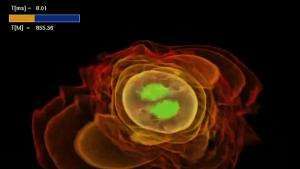 Video - Neutron stars colliding (animation). Video - Neutron star collision. ↑ The average density of material in a neutron star of radius 10 km is 7012110000000000000♠1.1×1012 kg cm−3. Therefore, 5 ml of such material is 7012550000000000000♠5.5×1012 kg, or 5 500 000 000 metric tons. This is about 15 times the total mass of the human world population. Alternatively, 5 ml from a neutron star of radius 20 km radius (average density 7010835000000000000♠8.35×1010 kg cm−3) has a mass of about 400 million metric tons, or about the mass of all humans. ↑ Even before the discovery of neutron, in 1931, neutron stars were anticipated by Lev Landau, who wrote about stars where "atomic nuclei come in close contact, forming one gigantic nucleus"). However, the widespread opinion that Landau predicted neutron stars proves to be wrong. ↑ Bulent Kiziltan (2011). Reassessing the Fundamentals: On the Evolution, Ages and Masses of Neutron Stars. Universal-Publishers. ISBN 1-61233-765-1. ↑ "Nasa Ask an Astrophysist: Maximum Mass of a Neutron Star". 1 2 3 4 5 Paweł Haensel; A Y Potekhin; D G Yakovlev (2007). Neutron Stars. Springer. ISBN 0-387-33543-9. ↑ Hessels, Jason; Ransom, Scott M.; Stairs, Ingrid H.; Freire, Paulo C. C.; et al. (2006). "A Radio Pulsar Spinning at 716 Hz". Science. 311 (5769): 1901–1904. 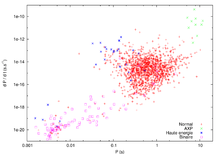 arXiv:astro-ph/0601337 . Bibcode:2006Sci...311.1901H. doi:10.1126/science.1123430. PMID 16410486. ↑ Naeye, Robert (2006-01-13). "Spinning Pulsar Smashes Record". Sky & Telescope. Retrieved 2008-01-18. ↑ Camenzind, Max (24 Feb 2007). Compact Objects in Astrophysics: White Dwarfs, Neutron Stars and Black Holes. Springer Science & Business Media. p. 269. ISBN 978-3-540-49912-1. ↑ Zhang, Bing; Xu, R.X. ; Qiao, G.J. (2000). "Nature and Nurture: a Model for Soft Gamma-Ray Repeaters". The Astrophysical Journal. 545 (2): 127–129. Retrieved 22 August 2016. ↑ Özel, Feryal; Psaltis, Dimitrios; Narayan, Ramesh; Santos Villarreal, Antonio (September 2012). "On the Mass Distribution and Birth Masses of Neutron Stars". The Astrophysical Journal. 757 (1): 13. arXiv:1201.1006 . Bibcode:2012ApJ...757...55O. doi:10.1088/0004-637X/757/1/55. Retrieved 14 May 2015. ↑ Chamel, N.; Haensel, P.; Zdunik, J.L. ; Fantina, A.F. (19 November 2013). "On the Maximum Mass of Neutron Stars". International Journal of Modern Physics. 1 (28): 1330018. arXiv:1307.3995 . Bibcode:2013IJMPE..2230018C. doi:10.1142/S021830131330018X. ↑ , a 10 M☉ star will collapse into a black hole. 1 2 3 "Introduction to neutron stars". Retrieved 2007-11-11. ↑ Neutron degeneracy pressure (Archive). Physics Forums. Retrieved on 2011-10-09. ↑ "McGill SGR/AXP Online Catalog". Retrieved 2 Jan 2014. ↑ "Peligroso lugar para jugar tenis". Datos Freak (in Spanish). Retrieved 3 June 2016. 1 2 NASA. Neutron Star Equation of State Science Retrieved 2011-09-26 Archived February 20, 2013, at the Wayback Machine. ↑ Pons, José A.; Viganò, Daniele; Rea, Nanda (2013). "Too much "pasta" for pulsars to spin down". Nature Physics. 9 (7): 431–434. arXiv:1304.6546 . Bibcode:2013NatPh...9..431P. doi:10.1038/nphys2640. 1 2 3 4 5 6 7 8 9 10 11 J. J. Condon & S. M. Ransom. "Pulsar Properties (ESSENTIAL RADIO ASTRONOMY)". National Radio Astronomy Observatory. Retrieved 24 March 2016. 1 2 3 4 5 6 George Pavlov. "X-ray Properties of Rotation Powered Pulsars and Thermally Emitting Neutron Stars" (PDF). 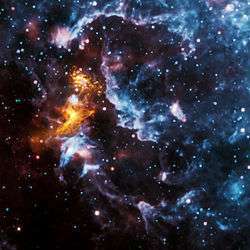 pulsarastronomy.net. Retrieved 6 April 2016. ↑ D. Klochkov; G. Puehlhofer; V. Suleimanov; S. Simon; K. Werner; A. Santangelo (2013). "A non-pulsating neutron star in the supernova remnant HESS J1731-347 / G353.6–0.7 with a carbon atmosphere". Astronomy & Astrophysics. 556: A41. arXiv:1307.1230 . Bibcode:2013A&A...556A..41K. doi:10.1051/0004-6361/201321740. 1 2 "7. Pulsars at Other Wavelengths". Frontiers of Modern Astronomy. Jodrell Bank Centre for Astrophysics. Retrieved 6 April 2016. ↑ K.T.S. Brazier & S. Johnston (August 2013). 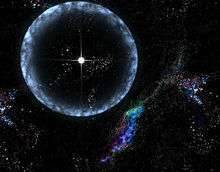 "The implications of radio-quiet neutron stars". Monthly Notices of the Royal Astronomical Society. 305 (3): 671. arXiv:astro-ph/9803176 . Bibcode:1999MNRAS.305..671B. doi:10.1046/j.1365-8711.1999.02490.x. ↑ B. ZHANG. "SPIN-DOWN POWER OF MAGNETARS" (PDF). Universidade Federal do Rio Grande do Sul. Retrieved 24 March 2016. ↑ Alpar, M Ali (January 1, 1998). "Pulsars, glitches and superfluids". Physicsworld.com. ↑ "Powerful processes at work". Retrieved 15 July 2016. ↑ Posselt, B.; Neuhäuser, R.; Haberl, F. (March 2009). "Searching for substellar companions of young isolated neutron stars". 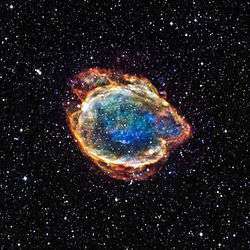 Astronomy and Astrophysics. 496 (2): 533–545. arXiv:0811.0398 . Bibcode:2009A&A...496..533P. doi:10.1051/0004-6361/200810156. ↑ Taylor, J.H. ; Weisberg, J.M. (Feb 15, 1982). "A new test of general relativity - Gravitational radiation and the binary pulsar PSR 1913+16". The Astrophysical Journal. 253: 908. ↑ Tanvir, N.; Levan, A.J. ; Fruchter, A.S.; Hjorth, J.; Hounsell, R.A.; Wiersema, K.; Tunnicliffe, R.L. (2013). "A `kilonova' associated with the short-duration gamma-ray burst GRB 130603B". Nature. 500: 547. ↑ Urry, Meg (July 20, 2013). "Gold comes from stars". CNN. ↑ Baade, Walter & Zwicky, Fritz (1934). "Remarks on Super-Novae and Cosmic Rays". Phys. Rev. 46 (1): 76–77. Bibcode:1934PhRv...46...76B. doi:10.1103/PhysRev.46.76.2. ↑ Landau L.D. (1932). "On the theory of stars". Phys. Z. Sowjetunion. 1: 285–288. ↑ Chadwick, James (1932). "On the possible existence of a neutron". Nature. 129 (3252): 312. Bibcode:1932Natur.129Q.312C. doi:10.1038/129312a0. ↑ Hewish, A. & Okoye, S. E. (1965). "Evidence of an unusual source of high radio brightness temperature in the Crab Nebula". Nature. 207 (4992): 59–60. Bibcode:1965Natur.207...59H. doi:10.1038/207059a0. ↑ Shklovsky, I.S. (April 1967). "On the Nature of the Source of X-Ray Emission of SCO XR-1". Astrophys. J. 148 (1): L1–L4. Bibcode:1967ApJ...148L...1S. doi:10.1086/180001. ↑ Demorest, PB; Pennucci, T; Ransom, SM; Roberts, MS; et al. (2010). "A two-solar-mass neutron star measured using Shapiro delay". Nature. 467 (7319): 1081–1083. arXiv:1010.5788 . Bibcode:2010Natur.467.1081D. doi:10.1038/nature09466. PMID 20981094. ↑ Antoniadis, J (2012). "A Massive Pulsar in a Compact Relativistic Binary". Science. 340 (6131): 1233232. arXiv:1304.6875 . Bibcode:2013Sci...340..448A. doi:10.1126/science.1233232. ↑ Sandro Mereghetti (April 2010). "X-ray emission from isolated neutron stars". High-Energy Emission from Pulsars and their Systems. Astrophysics and Space Science Proceedings. p. 345. arXiv:1008.2891 . doi:10.1007/978-3-642-17251-9_29. ISBN 978-3-642-17250-2. ↑ Nakamura, T. (1989). "Binary Sub-Millisecond Pulsar and Rotating Core Collapse Model for SN1987A". Progress of Theoretical Physics. 81 (5): 1006–1020. Bibcode:1989PThPh..81.1006N. doi:10.1143/PTP.81.1006. ↑ Neutrino-Driven Protoneutron Star Winds, Todd A. Thompson. "ASTROPHYSICS: ON OBSERVED PULSARS". scienceweek.com. Retrieved 6 August 2004. Norman K. Glendenning; R. Kippenhahn; I. Appenzeller; G. Borner; et al. (2000). Compact Stars (2nd ed.). Kaaret; Prieskorn; in 't Zand; Brandt; et al. (2006). "Evidence for 1122 Hz X-Ray Burst Oscillations from the Neutron-Star X-Ray Transient XTE J1739-285". The Astrophysical Journal. 657 (2): L97. arXiv:astro-ph/0611716 . Bibcode:2007ApJ...657L..97K. doi:10.1086/513270. 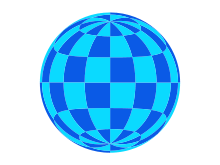 Wikimedia Commons has media related to Neutron stars. "Mysterious X-ray sources may be lone neutron stars". New Scientist. "Massive neutron star rules out exotic matter". New Scientist. According to a new analysis, exotic states of matter such as free quarks or BECs do not arise inside neutron stars. "Neutron star clocked at mind-boggling velocity". New Scientist. A neutron star has been clocked traveling at more than 1500 kilometers per second.